The Evansville Police Department has notified the University that they have received complaints about individuals violating the parking restrictions on Walnut Avenue near the Townhouses. Parking is not allowed on the north side of Walnut between the hours of 6:00-9:00 a.m. and from 3:00-6:00 p.m. on the south side. They will be issuing parking citations for violators and vehicles may be towed. They have also received complaints about improper parking on Rotherwood Avenue between Lincoln Avenue and Walnut. Citations were issued today in this area for parking in front of a fireplug and parking on yellow curbs. No vehicles were towed today, however we were advised that future violators will be subject to having their vehicles towed. Please obey the parking regulation on the streets around our campus. Turn in your United Way pledge form today to win! Early Bird deadline: October 3 at 5:00 p.m. Regular deadline: October 12 at 8:00 a.m.
Don’t forget to take a moment today to fill out your United Way pledge form. The Early Bird Grand Prize is a $250 gift card to Best Buy! Please read the information in your packet and if you have any questions, feel free to contact Office of Human Resources at ext. 2943. Join UE today in helping make the Evansville community a better place for everyone! The Department of Theatre kicks off the 2016–17 season with Philip Dawkins' Failure: A Love Story. From one of Chicago’s most-intriguing theatrical voices, this fanciful and charming play introduces us to the Fail sisters, all of whom will be dead within a year. This vibrant comedy finds these three quirky women unwittingly living out their final days in their family’s bustling 1920s Chicago clock shop - and falling in love with the same suave and dashing man. Audiences will certainly be charmed by this musical fable and yearn to truly understand and harness the power of love. The final shows are September 29, September 30, and October 1 at 7:30 p.m., and October 2 at 2:00 p.m. in Shanklin Theatre. Tickets are $15 for adults and $13 for senior adults, non-UE students, and UE faculty and staff. UE students are entitled to one free ticket on the day of the performance they wish to attend. Tickets can be reserved by stopping by or calling the ticket office at 812-488-2031 between noon-5:00 p.m. Monday through Saturday or from noon-1:00 p.m. on Sunday. How well do you know your roommate? Find out by participating in Roommate Games tonight at 8:30 p.m. in Eykamp Hall, Room 251, Ridgway University Center. Come to this action packed, game show style presentation and discover who knows their roommate the best. You will also get tips and resources for living with a roommate. Roommates are encouraged to come together to this event. The winning roommate team wins dinner at Steak-n-Shake! UE faculty members and student to talk at TEDxEvansville this weekend! Don't miss the TEDxEvansville event this Saturday, October 1, from 1:00-4:00 p.m. Tickets for the event to be held at the Evansville Museum's Koch Immersive Theater are sold out, but there will be a free viewing party in the Ridgway University Center. All talks will be streamed free online as well. Jill Griffin, director of the Institute for Global Enterprise, will talk about "Changemaker Math and the Art of Critical Doing." Basel Al Haj, a Syrian biochemistry major, will present "A Syrian Story." James MacLeod, professor of history, and Joe Atkinson, digital multimedia specialist, will present "Rising to the Challenge: Evansville Then and Now." For more information, visit www.tedxevansville.com/speakers. Are you interested in having a more environmentally friendly campus? Then you should come to the Eco Club call out meeting. Join us today at 8:00 p.m. in Room 124 in the Koch Center for Engineering and Science. We will be discussing our plans for this year (composting, community garden, recycling, etc.). With the launch of student planning this fall for spring registration, we are offering several information sessions (see below) to help students become familiar with the new online registration process. We will also be posting video tutorials and step-by-step instructions prior to advising week (October 24). The Newman Club will serve homemade spaghetti and desserts today at the Newman Center, located on the corner of Lincoln and Frederick, from 5:00-6:30 p.m. Everyone is welcome to attend! For more information, contact ov4@evansville.edu or je46@evansville.edu. The Newman Club is hosting a fall blood drive on Tuesday, October 18 from noon-6:00 p.m. If you are interesting in either giving blood or donating your time through volunteer work, contact Paige Hignite at ph89@evansville.edu. The Chinese Club is planning a dumpling night at the restaurant Yang's Shabu Shabu on September 30 from 4:15-6:00 p.m. To attend, you must pay the club’s $2 membership fee. 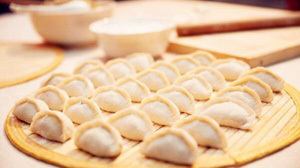 With the $2, you get a free meal of dumplings and have the opportunity to learn to make dumplings yourself. As a member of Chinese Club, you will also be able to attend other events planned for the year, including Chinese knot lessons, a ping pong ball race, a cookout featuring Asian food, and Chinese movie night. You can pay the membership fee and sign up to attend dumpling night at a table in the lobby of Ridgway University Center on Tuesday and Wednesday from noon-2:00 p.m. Or sign up and pay the membership fee by e-mailing ac281@evansville.edu. Car pool transportation to dumpling night will be provided for those without a car. The car pool group will meet at the parking lot between Moore and Brentano Halls at 4:00 p.m. to leave for the event. If you would like to car pool, e-mail ac281@evansville.edu. On October 1, there will be a TedX viewing party from noon-3:00 p.m. upstairs in Ridgway University Center. This TedX Evansville event will feature our very own UE student and Scholars for Syria member Basel Al Haj. Basel will be sharing his immigration story and will highlight the ways in which the turmoil of war and global politics has negatively impacted his culture. In the midst of the Syrian war, Basel will be catalyzing an important dialogue about Syrian culture and immigration. We invite all students, faculty and community members to attend the viewing party free of charge. For more information, please contact km349@evansville.edu. The Office of Development is pleased to announce that the University of Evansville’s Department of Art was recently awarded a $22,000 grant from the Efroymson Family Fund. This generous gift will fund the Efroymsom Family Contemporary Artist Lecture Series, facilitate programming to bring additional local visiting contemporary artists to exhibit their work in the Krannert and Melvin Peterson Galleries, fund a marketing and event planning intern, and provide funds to purchase two new ceramic kilns. The gift represents the Efroymson Family Fund’s generous and continued support of the arts at the University of Evansville. Venturing Crew fall break trip: deadline tomorrow! Join the members of Venturing Crew for fall break in Missouri. They will kick off the trip with a visit to the City Museum in St. Louis - which is an adult playground. They will spend the majority of fall break canoeing the Current and Jack’s Fork Rivers, camping, and hiking. After a trip full of outdoor cooking and activities, they will swing by Lambert’s Café (“Home of Throwed Rolls”) on the way back to campus. Venturing Crew officers will be available at Ridgway University Center tables today during lunch and dinner. The cost of the trip is $130, and you must be a Venturing Crew member to attend. The deadline for payment is September 30. If you would like more information, visit the Ridgway University Center tables or e-mail venturing@evansville.edu. They hope you will join them for a wonderful fall break! GAP is now accepting project proposals from both faculty members and students. If you have an idea to make a difference in your community, we encourage you to apply. Class credit and financial support is available and your idea can help nonprofits, for profit businesses, or civic projects. Submit your proposal no later than 5:00 p.m. on October 7. Spots are limited, so apply early! Students can submit their project suggestions here. For more information, call 812-488-5002 or visit www.evansville.edu/gap. Be part of a research study – it’s as easy as breathing! Kyle Kiesel, professor of physical therapy, and students in the Department of Physical Therapy are searching for individuals to participate in a research study investigating the relationship between breathing and movement. Participants should be between 20-50 years old. The testing session is a one-time commitment lasting approximately 20-30 minutes. Testing takes place Monday, October 3, at 10:00 a.m.-2:00 p.m., in Carson Center in the aerobics room. Contact jk245@evansville.edu if interested to schedule your testing session or for any questions. During Homecoming Weekend we plan to recognize and crown Mr. and Miss UE. To be eligible, students must be a fulltime student and member of the senior class. Nominations may be made by anyone on campus, either a student organization, group of friends, team, roommates, etc. To nominate someone, you are asked to complete the nomination form by next Wednesday, October 5 by 5:00 p.m. Nominations can be made based on the student’s preferred gender. Come get your flu shot on October 3 from 7:00-11:00 a.m., and October 4 from 2:00-6:00 p.m. at the UE Medical Clinic. These are free flu shots for employees and family members on the UE insurance. Other participants will pay $20 and will receive a receipt to submit for reimbursement through their insurance. Go to Acelink > Home page > and click on the Flu Shot Blitz to sign up! There will no Open Swim this Friday evening, September 30, and Saturday, October 1, due to UE’s swimming and diving competition. The Office of Grants and Sponsored Programs (OGSP) would like to announce the third round of featured grant opportunities for the Fall 2016 semester! At OGSP, we oversee federal and state funding opportunities, assisting faculty and staff in the process of applying for external funding in support of scholarly and creative activities. These activities include: basic research, applied research, fellowships, curriculum development, community outreach, international exchange, sabbatical support, and faculty-guided student research. Starting this year, OGSP plans to publish information regarding upcoming grant opportunities and deadlines in AceNotes. We encourage faculty and staff to contact us with any questions regarding these grants or any other opportunities. Our office is in Room 205 in the Olmsted Administration Building and you can reach the director of OGSP and IRB administrator and chair Johnna-Denning Smith by phone at 812-488-2551 or by e-mail at jd184@evansville.edu. Admission Ambassador applications now available! UE Admission Ambassador applications are now available. Please go here to fill out the application. Once you fill out the application, you will need to send this recommendation form to the UE faculty or staff serving as your reference. The deadline for admission ambassador applications is by midnight on October 6. If you have any questions, please e-mail Sarah Harness at sh287@evansville.edu or Gabby Hickey at gh54@evansville.edu. Make an appointment today to have your portrait taken for the 2017 LinC. If you are graduating in December 2016 or May 2017, you're eligible. It's free — all you need is an appointment. Call 812-488-2846 or visit Student Publications, located on the second floor Ridgway University Center. Information letters went out last week to pending graduates. If you didn't receive one, stop by Student Publications. Don't know how to register to vote? The deadline to register to vote for the upcoming election in Indiana is October 11. Faculty, staff, and community partners will be on hand in the lobby of Ridgway University Center on October 3-6 from 10:00 a.m.–2:00 p.m., to help students register to vote! This non-partisan initiative can help students from all states get informed and get registered. Every vote matters and all voices should be heard in this upcoming election. The UE Bookstore will soon begin the return process of unsold books so if you still need a textbook please come to the bookstore and purchase your requirements. If for some reason you still need a textbook but do not have the funds to purchase your book now the bookstore will be happy to hold you a copy until a designated date. You may do this at the bookstore’s textbook counter. If you have any questions please contact the UE Bookstore. The Resident Students Association and Sodexo are looking for a student input team. Selected students can earn up to $30 in AceBucks each month. The Food Advisory Board (FAB) program gives students the opportunity to act as a liaison between the students, the University of Evansville, and Sodexo. The FAB at University of Evansville was created as a breakout group of the Resident Students Association (RSA) to represent the voices of the students, while also assisting with shaping Sodexo’s culinary programs and offerings. Not only do they help shape promotions, they continuously provide insight from students to Sodexo. If you are interested in applying to be part of the Food Advisory Board, fill out this application and return it to Brian Conner in the Office of Residence Life by September 30. All students can apply, but it is helpful if you have a meal plan and/or dine regularly on campus. Robert Dion, chair of the Department of Law, Politics, and Society, was interviewed on Radio-Canada on Tuesday and gave his impressions of the first presidential debate between Donald Trump and Hillary Clinton. The interview was broadcast live nationwide on the Midi Info program and was conducted entirely in French. A link to the broadcast can be found here. The interview starts at about 12:27 and lasts for about eight minutes. Celebrating its 110th season, the Missouri Valley Conference will have an exclusive 104-event package on ESPN networks during the 2016-17 academic year, commissioner Doug Elgin announced today. The Valley, which enters the third year of a 10-year agreement with ESPN, will clear 41 men’s basketball telecasts on ESPN platforms -- ESPN, ESPN2, ESPNU, and ESPN3. Another 63 MVC events -- regular-season baseball and women’s basketball plus postseason championships for women’s and men’s soccer, volleyball, indoor and outdoor track and field, women’s basketball, softball, and baseball -- are featured in the package this year. An additional 450 live events by Conference institutions will be delivered exclusively by The Valley on ESPN3 -- the league’s co-branded digital network with ESPN. “Through multi-layered platforms, ESPN provides us with an invaluable national promotional vehicle in an ever-evolving video environment,” Elgin said. The ESPN men’s basketball package begins with Wichita State playing host to Tulsa on November 16 in the first of four league-produced exclusive non-conference games on ESPN3. San Diego State at Loyola (December 3), Butler at Indiana State (December 7) and Oklahoma State visiting Wichita State at INTRUST Bank Arena (December 17) complete the non-MVC contests for ESPN3. The game at Loyola is one of nine match-ups on December 3 which are part of the Mountain West-Missouri Valley Challenge. This will be the second year of a four-year agreement between the leagues, with Evansville, Indiana State, Southern Illinois, and Wichita State securing wins during the 2015 event. The Missouri Valley Conference also has two additional non-conference contests on ESPN platforms -- Wichita State versus Oklahoma in Oklahoma City (ESPN2) on December 10, and Northern Iowa at North Carolina (ESPN2) on December 21. Four MVC schools will compete in ESPN Events-branded multi-team tournaments - Northern Iowa in the Tire Pros Puerto Rico Tip-Off, which has been relocated to Orlando, Florida, Illinois State in the Hawaiian Airlines Diamond Head Classic, Indiana State in the AdvoCare Invitational, and Wichita State in the Battle 4 Atlantis. Each league school will participate in three games with every contest being delivered on an ESPN platform -- ESPN2, ESPNU, or ESPN3. In terms of league regular-season men’s basketball shows, The Valley has two contests on ESPN2 -- Wichita State at Illinois State (January 14) and Illinois State at Wichita State (February 4) -- and another where ESPN will utilize the netflex process (waiting until 7-10 days out from competition) to determine whether the game -- UNI at Wichita State (February 18) -- is shown on ESPN or ESPN2. For the final Conference’s exposure on Saturday, Feb. 25, ESPN will utilize both the netflex and Wildcard (picking one of five games) selection processes to determine which match-up is shown on ESPN or ESPN2. The Valley’s regular-season men’s basketball package on ESPNU will feature one Saturday and five Sundays. The Sundays will also use the ESPN netflex selection process (one game appearing on The Valley on ESPN3 and the other on ESPNU). The remaining two ESPNU telecasts will be Valley regular-season baseball contests which have yet to be determined. The conference will distribute league-produced, nine-week men’s basketball (Wednesday, Thursday or Saturday) and women’s basketball (Fridays or Sundays) packages on ESPN3 -- ESPN’s live multi-screen sports network streamed line on WatchESPN, accessible on computers, smartphones, tablets and connected devices to fans who receive their video subscription from an affiliated provider. The men’s basketball package starts on Thursday, December 29, with Bradley playing host to Southern Illinois. The opening round on March 2 and all four quarterfinal games on March 3 from the 2017 State Farm MVC Men’s Basketball Tournament in St. Louis will also be shown on ESPN3 outside the league’s five-state footprint of Illinois, Indiana, Iowa, Kansas, and Missouri. The women’s league slate on Fridays begins December 30, when Indiana State visits Evansville. The final two women’s basketball airings will utilize the Wildcard selection process to determine which games will be distributed on February 17 and February 24, with the selected contests announced on February 3 and February 10, respectively. The entire women’s basketball tournament will be shown on ESPN3, with coverage beginning on Thursday, March 9, with two opening round contests, four quarterfinal telecasts on Friday, March 10, two semifinal games on Saturday, March 11, and the title contest on Sunday, March 12. The Valley will also air its postseason championships for women’s and men’s soccer, volleyball, indoor and outdoor track and field, softball and baseball in their entirety on ESPN3. “The 2015-16 academic year was a tremendous one for our Conference, and The Valley on ESPN3 was the perfect platform to share numerous league stories,” Watkins said. “We conducted an epic volleyball tournament in 2015, where Wichita State rallied from 2-0 set deficits in semifinal and title matches to take the tournament. In fact, all four semifinalists -- Missouri State, UNI, Southern Illinois and Wichita State -- were showcased on The Valley on ESPN3 and subsequently received bids to the NCAA Tournament,” he added. “Thanks to the endorsement from ESPN and the support from the MVC Presidents Council, we have the ability to reach a national audience every day via The Valley on ESPN3,” he concluded. Postseason coverage starts with the 2016 MVC Women’s Soccer Championship at Adelaide Street Field in Normal, Illinois, on Friday, November 4 (semifinals) and Sunday, November 6 (title match). The 2016 MVC Men’s Soccer Championship at Allison Stadium South in Springfield, Missouri, will be contested on Tuesday, November 8 (opening round), Wednesday, November 9 (quarterfinals), Friday, November 11 (semifinals), and Sunday, November 13 (title match). For the fifth-straight year, The Valley will deliver the MVC Volleyball Championship on ESPN3, and in 2016, all five matches will be shown from McLeod Center in Cedar Falls, Iowa, on Thursday, November 24 (quarterfinals), Friday, November 25 (semifinals) and Saturday, November 26 (title match). For the third-straight year, the Conference will televise competition from the 2017 MVC Indoor Track and Field Championship at the UNI-Dome in Cedar Falls, Iowa, on Saturday-Sunday, February 25-26. In the spring, The Valley will air the 2017 MVC Softball Tournament from Marian Kneer Stadium at Normal, Illinois, on Thursday-Saturday, May 11-13. For the second time in league history, The Valley will televise competition from the 2017 MVC Outdoor Track and Field Championship at Allison Stadium South in Springfield, Missouri, on Friday-Sunday, May 12-14. The league will conclude its 2016-17 schedule on ESPN3 on Wednesday-Saturday, May 24-27, from the 2017 MVC Baseball Championship at Hammons Field in Springfield, Missouri. It will mark the sixth consecutive year that games from the tournament have been shown on ESPN3, beginning with the 2012 event from Hammons Field. “Whether it’s viewership or recruitment, we value each and every opportunity to showcase our student-athletes, coaches and facilities,” he concluded. The conference also plans to televise the 2016 MVC Men’s and Women’s Basketball Tipoff in St. Louis on Tuesday, October 25, and its 2017 MVC Women’s Basketball Tournament Preview Show from the iWireless Center in Moline, Illinois, on Thursday, March 9. The University of Evansville Women’s Tennis team is at home this weekend as the Purple Aces have teamed up with the University of Southern Indiana to co-host the First Annual Evansville Metro Collegiate Invite at Wesselman Park. The tournament will feature nine teams, including the hosts, from around the region. The visiting schools will include Division I programs Western Kentucky, Cincinnati, Austin Peay, Belmont, and Tennessee-Martin, and Division II schools Bellarmine and North Alabama. The tournament will feature both singles and doubles and will take place on the 12 courts at Wesselman Park. Play will begin Saturday October 1 at 9:30 a.m., and includes two rounds of singles and two rounds of doubles. Play will continue Sunday at 9:30 a.m. with all final-round matches of both singles and doubles.